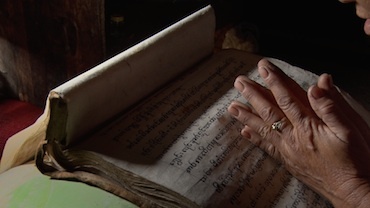 An old woman from Mong Htet in northern Shan State in Myanmar looks back on a life marked by privation and loss. Her memories are interwoven with images that touch on this conflicted state’s past, present and future. Sai Naw Kham grew up in Tangyan Township in Myanmar’s northern Shan State. Moving to Yangon in 2007, he first studied chemistry and worked for three years as an editor for Charr Music Production. His first brush with filmmaking came when he filmed his uncle’s donation to a Palaung village; the Palaung continue to fascinate him and he hopes to one day make a feature-length film with them. Since joining YFS in 2014 he has directed a documentary, The Crocodile Creek. In 2015 he photographed a short YFS drama, Book Lover. To me, film is like time travel. In 32 Souls, I wanted to recall past wars and imagine souls gazing on the present; I also wanted to journey into the future via the prayer at the end. 32 Souls is partly a portrait of my grandmother’s cousin and partly a poetic contemplation of a society in ruins as a result of war, environmental damage and the gradual erosion of belief systems.